A home improvement project can do wonders to enrich the space around you, transforming your house from simply a place to sleep and eat into a sanctuary from the outside world. Tile installation can turn a room into a relaxing retreat, as well as boost the value of your house. There are dozens of tile varieties. Before you make a purchase, plan out exactly how you want your finished product to look. For example, if you are adding subway tile to your bathroom, will you use a monochrome or two-tone pattern? Will you mix hexagon tiles with chevron shapes, or do you prefer the uniformity of square tiles? Find a pattern you like and modify it to make it your own. Experiment with color and shape before making decision. Design magazines, such as Interior Design Magazine or Luxe, are a perfect starting point. Or, browse Pinterest and Houzz for ideas. Before you purchase materials, pay close attention to the technical specifications of the material. This means understanding how the product can be used. Can it be used on walls only? Or floors? If being used for flooring, does the material offer slip resistance? Be especially careful about choosing materials for areas where the traffic will be a little higher, such as breezeways and kitchens. Most websites should tell you how the material can be used. If want to use stone tile or mosaics for your kitchen backsplash, you'll need a dense material that’s not too porous – to help avoid stains. 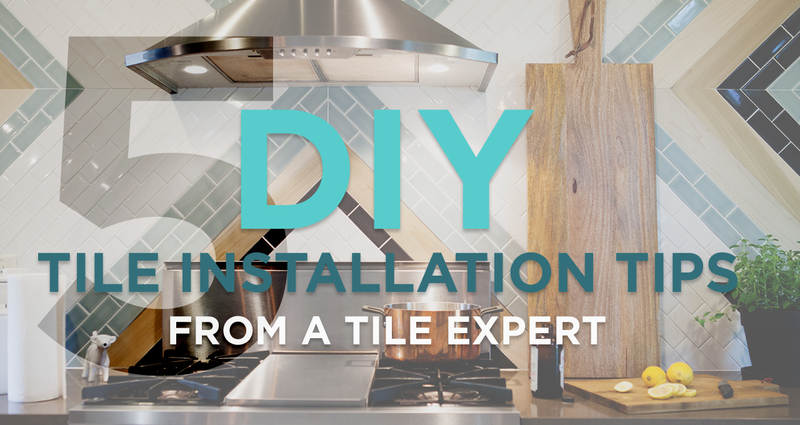 Try to select a material that’s recommended for use as a backsplash. Soft stone types may stain if exposed to grease, dirty water or harsh chemicals. For instance, porous limestone tiles are more likely to stain than dense marble tiles or porcelain tile. Materials with a high abrasion resistance, or a higher Mohs scale rating, will be less likely to show signs of wear and tear. Although, some people don’t mind the look of a slightly worn material. It’s all a matter of preference. As a final design flourish, consider the details of the design. For example, you might want to replace your light switch and outlet covers with new ones that complement your tile design. In the kitchen, stainless steel plates look great with porcelain or natural stone tiles. In the bathroom, you might opt for decorative ceramic plates that complement your tile selection. When you put in the time and effort, you'll be proud of your beautifully finished product. To get inspired for your next DIY tile installation project, visit missionstonetile.com.